The PicoBrew brewing a beer beverage. The Internet is adding a bit of hop to the art of beer crafting with a new appliance that can not only brew the alcoholic beverage, but also tap online resources and services, and be controlled via a web browser. At this year's International CES show, almost everything on display, from dog collars to pots for house plants, has evolved into a smart device. And so is equipment that can brew beer. 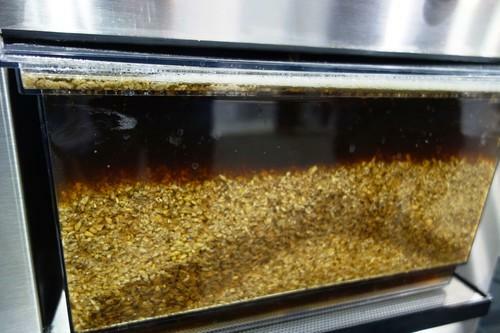 Meet PicoBrew Zymatic, which is marketed as the world's first fully automatic all-grain brewing appliance. The product was at the show and in use, crafting fresh beer. "It takes a commercial brewery and scales it down to your countertop," Greg White, a software engineer with Seattle-based PicoBrew, said on Wednesday. Shaped like a metal oven, the 50-pound appliance can brew beer in about 3.5 to 4 hours, and produces about 3 gallons of beverage in each batch. Once done, the beer can be poured and stored for days or a few weeks. Users simply place their beer ingredients in a cartridge tray that goes inside the appliance. The brewing is automated, but the product comes with Wi-Fi and Ethernet connectivity, letting the user control it from a connected device such as a smartphone. The appliance can access over 100 recipes in the PicoBrew cloud-hosted library. Users can also tap a company-developed "recipe crafter" web app to build new brews. I tried a glass of the Pico Pale Ale that was brewed from the appliance and found it to be not bad. The hope is also to make the beer brewing social, he said. Users can take the data from the appliance and share it online, including the recipes. Started as project on Kickstarter, the self-cleaning appliance comes at a hefty price: US$1699. Users can pay another $100 to receive a keg made for the device. The company has just finished shipping the product to its Kickstarter backers, and is taking pre-orders, which it expects to start fulfilling in March.